I have a very beautiful la familia. 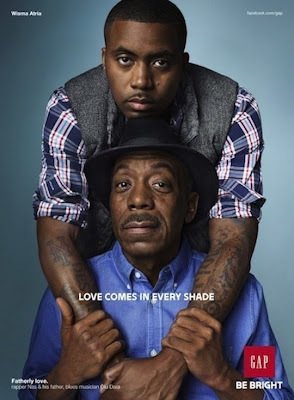 My uncle Nas and his Dad, Jazz/Blues artist - Olu Dara pose it up for GAP Holiday Campaign. The GAP campaign is based on 'love', their slogan "Love comes in Every Shade" shows that in their campaign ad (below). Nas and his Father feature in the ad as well. Nas uploaded the pic via his twitter/instagram account earlier this week.